Last month I talked about the women of Decatur, Illinois, and the service project meeting a daily train carrying wounded warriors to hospitals in the north. The project earned the women the monniker the "Basket Brigade." Other kinds of baskets and brigades involved women, too. was photographed in camp (check out that basket! ), and it appears her family is with her. 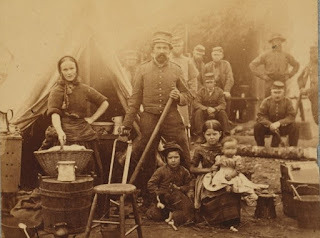 Did you know that women were present in Civil War camps? Long encampments made that possible. In fact, those camps benefited from the presence of women to cook, mend, do laundry., etc. 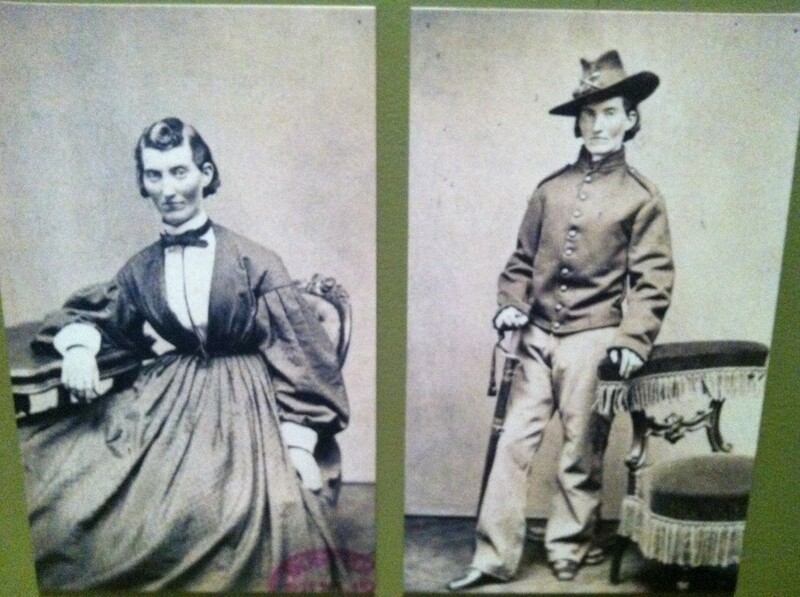 Mary Kennerly of St. Louis followed her husband when he joined the Confederate Army. In fact, she gave birth to her third child in a military camp in 1862. 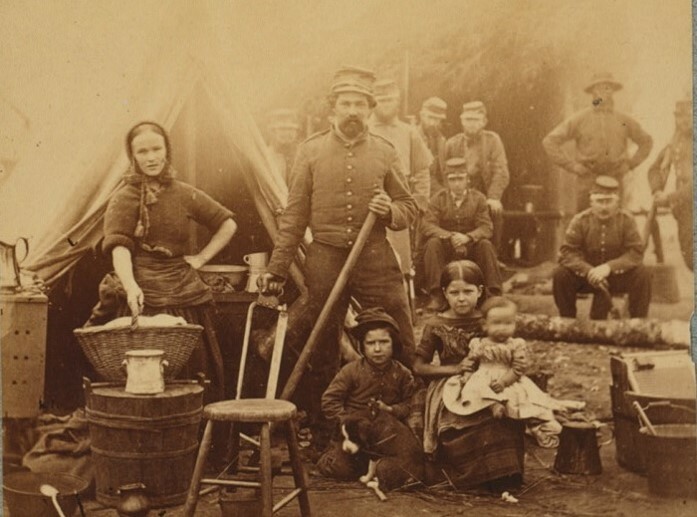 She also endured the siege of Vicksburg, serving as a nurse for the wounded members of her husband's unit. When her husband died of dysentery, Mary stayed with the 1st Missouri. She even wore a Confederate uniform and joined the battle of Allatoona, where she was shot in the leg. Mrs. Kennerly returned to St. Louis after the war and lived there until her death in 1894. Scholars have compiled a list of 100 women who served as soldiers. One of the better known is pictured here. Frances Clayton served in both artillery and cavalry regiments. Described as an accomplished swordsman, horse rider, and "all-around good soldier," Clayton was wounded at Fort Donelson, Tennessee. She was alongside her husband at the Battle of Stones River when he was killed just steps away from her. I once photographed the discharge papers of one John Williams on display at the Missouri History Museum. The reason for discharge? "Proved to be a woman." Kady Brownell of Rhode Island was so well respected by her regiment that at least one poem was written in praise of her service. Learning about women from the past can be inspiring. What woman from history do you admire most? Why? Stephanie Grace Whitson celebrates the lives of women who served during the Civil War in both her recent novels. was #7 on the ECPA bestseller list for November. To be entered to win a copy, answer Stephanie's question about the woman from history you most admire. Learn more about Stephanie and her work at www.stephaniewhitson.com. A female that I greatly admire is Amy Carmichael. She was an Irish missionary who is best known for her missionary work in India. I became more aware of her work after reading one of the many books she had written in her later life. Amy Carmichael devoted her whole life to serving the needy in India even though she lived with an ailment that would leave her bed-ridden for weeks at a time. When a friend of mine suffered a stroke in her late 30's, it was one of Amy's books that I gave her for encouragement. I never forgotten reading Amy Carmichael's biography, A Chance to Die, written by Elizabeth Elliot. Two of Carmichael's poems are in my "favorites" notebook, and I still have a mental image from one of Carmichael's books about her time in India. Thank you for this reminder of a great woman. There is not one woman but all the women that traveled on the oregontrail. They were some of the bravest women out there. I agree. I have a friend who says that if it had been up to her to settled the West, we'd all still be in Boston drinking tea. Pioneer Girl is on my "to be read" pile right now. Have you read a book about Keller that you'd recommend? I'd like to learn more! Thanks for your kind words about the Basket Brigade women. Your comment about women who stepped out of the "normal" bounds of woman's role reminds me of all the women I've met since I started studying history in a more organized serious way. There were SO many! Ah, yes, the women in the "howling wilderness" ;-). I admire them, too. Corrie ten Boom is a great inspiration to me. This was a great post about the Basket Brigade. Thank you, Caryl. It will be great to meet the ten Boom's in heaven one day, won't it. What a legacy. There are so many women throughout history I admire for their courage and willingness to step outside the boundaries forced on them by society and make the world a better place whether that was through settling new lands, becoming doctors, scientists, reformers, explorers ... often at great personal cost. Thanks for sharing the Basket Brigades' stories with us. Glad you enjoyed the Basket Brigade women, Sandy! Our modern conveniences are a great blessing, aren't they. The year my husband was diagnoses with cancer was a tough one, and I remember one year thinking, "You know, life isn't great at the moment ... then again I didn't have to strain any toads or snakes out of well water this morning before I could make coffee ... and I didn't have to build a fire ... " and so on. I gave me perspective and reminded me I had a lot to be thankful for. Loved this post. 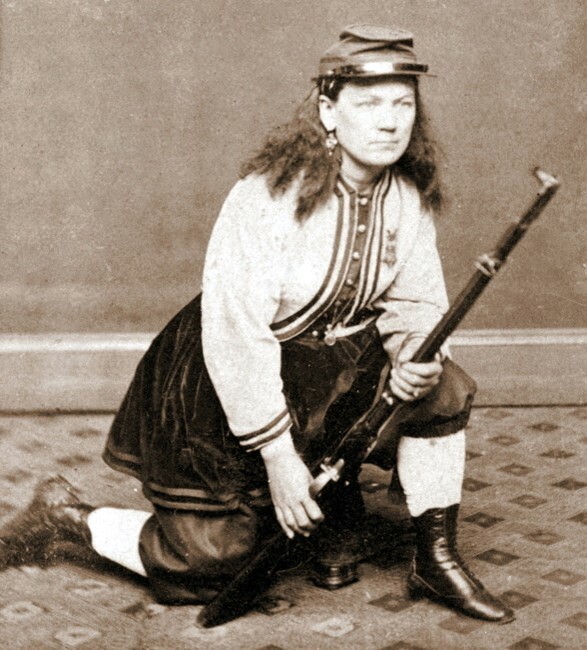 I had heard of women fighting during the Civil War. I love historical fiction and think I would enjoy this book very much. I love the title. There are many women I admire. One of them is Betty Zane who helped win what some people call the last battle of the Revolution at Fort Henry in Wheeling. I haven't heard of Betty Zane ... will look for that name. Thanks for introducing me to her! There are so many women in history that I admire. I would say that the pioneer women would be the ones I admire most because they went to a strange place and overcame many hardships to make a life for themselves and their families. Thank you for this post and this giveaway. As you probably know, learning about pioneer women is what inspired my first novel back in the 1990s. And look where it led me ... ;-). Corrie Ten Boom has my heart. To think of the terror she must have experienced, while helping the Jews escape, but standing firm on her faith in the Lord. Indeed. Her courage is truly amazing. Anything pertaining to history is a fun read for me. kamundsen44ATyahooDOTcom. Bless you, Diane. Thanks for continuing to be an encourager! I admire Nellie Bly for exposing horrific conditions in insane asylums and Dorothea Dix for her advocacy work for the mentally ill. Things have come a long way since then. I've read a bit about the history of psychiatry and treatments and it is truly horrifying to think of how people were treated. There is a museum in Missouri about it. So sad. I agree with the comment above about women who traveled the Oregon Trail... I remember reading about and really enjoying Jody Hedlund's book The Doctor's Lady, based on the story/life of Priscilla White. I love Jody's books! Dr. Whitman made a cameo appearance in my first book. The first biography I ever read was about Florence Nightingale so I have always had an admiration for this nurse who worked so tirelessly during the Crimean War. This 'Lady With The Lamp" is considered the founder of modern nursing. However, in my work as a public librarian in Kentucky, I learned about a group of women and men known as Pack Horse Librarians. From 1935 to 1943, local Kentucky people became a part of a program funded by the WPA to deliver reading materials to areas of Kentucky that were often so isolated that the only way to reach them was by horseback. They received very little salary and traveled in all kinds of weather. I drove our library's bookmobile for a few years and I saw first hand how eager our patrons in outlying areas were to have this service and it touched me deeply. I can only imagine how these Depression-era people felt when they saw these librarians arrive on horseback to deliver their links to other worlds, other times! So, even though I cannot mention specific names, these librarians have my utmost respect! Connie, that is a FASCINATING story! I hope someone writes about the Pack Horse Librarians. Another reminder of just how blessed we are ... and how easy it is to take reading and libraries for granted. 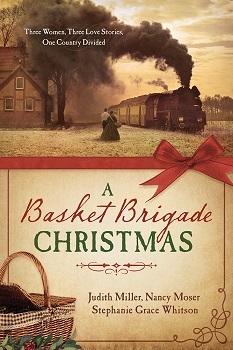 Glad you enjoyed the Basket Brigade stories and thanks for your kind words. So many good women mentioned here! I also admire those who traveled the Oregon Trail, maybe because I live in Oregon and it has such rich history. I can't imagine the harsh conditions, living environment & caring for those who got sick. Not to mention, giving birth on the trail! And what about the women who saw their husband's go off to war? My grandma was one of those who watched my grandpa go off to WW2 and had 9 kids to tend to!! She lived through a tough time in America's history and I can't imagine how hard it was. She's the woman I most admire :-) She's gone on to glory now, but she was always such a strong woman! So many good women who blazed the trail for us modern women to have the freedoms (ie:voting) we have today! You make a good point about women who are left at home to raise families, etc., whenever their men go off to war. That's true today, too. Our military families have it rough sometimes. You're not the only one who mentioned Florence NIghtingale ;-). I learned a bit about the nurses during the Civil War. They were not always welcomed, but they still did their duty.